Find your suitable Croozer with just 3 clicks! Whether you are on a bike ride, on a shopping spree in the city, on a walk in the park or at the beach – your Croozer easily adapts to your specific needs. Step 1: What do you want to carry? Choose what you want to carry with your bike trailer. Are you looking for a way to carry your children safely and comfortably? Do you want to transport items such as groceries, touring or travel equipment? Are you planning to take your furry friend on bike rides and want to make them feel safe and relaxed? The choice is yours! Step 2: How many seats do you need? Croozer child trailers come in one- and two-seater versions. They can be used for the safe and easy transport of children from 0-6 years of age. With the specially designed Baby Seat, you can even bring your baby on board. Both the one-seater and two-seater child trailers from Croozer have an extra-large rear cargo compartment for your shopping or supplies, as well as a low centre of gravity, offering outstanding stability on the road. Your children can ride along from age 0 to 6! They can accompany you on all of your outings, sitting safely and comfortably in the individual, ergonomic seats with 5-point harnesses. The narrow single-seater even fits through tight supermarket checkouts. And if you have two children, it doesn’t matter whether they are of the same weight or completely different in size: thanks to the low centre of gravity and wide wheelbase, you can transport both of them in a two-seater without having to worry about the even distribution of weight. And what if only one of your children is on board? Also no problem! Step 2: How big and how heavy is your dog? Measure the length of your dog from the tip of his nose to the base of his tail. The shoulder height is the distance from the ground to the top of the shoulder. For determining the right size of dog trailer, you will also need to know your dog’s weight. Your dog has a shoulder height of no more than 60 cm, a length of up to 85 cm and a weight of max. 25 kg? Then click on the green card! Your dog has a shoulder height of no more than 70 cm, a length of up to 100 cm and a weight of max. 35 kg? Then click on the blue card! Your dog has a shoulder height of no more than 85 cm, a length of up to 115 cm and a weight of max. 45 kg? Then click on the orange card! Step 3: Which model do you want to choose? As distinct from the Croozer Kid models, the Kid Plus comes with the Croozer AirPad® suspension and the integrated sensor light (Click & Flash®). The suspension is maintenance-free and easily adapts to the weight of your children in the trailer. Good choice: Your Croozer bike trailer! Congratulations! Your Croozer bicycle trailer is always available as a faithful companion for your daily routines. 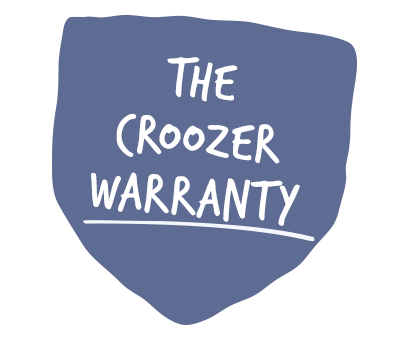 Croozer offers you high-quality products that will bring you many years of enjoyment. With your dependable companion, you can handle any errand or excursion safely and easily – regardless of whether it’s on a city street or a riverside bike path. Would you like to change your selection? Simply scroll back up!